Recently, tungsten rings are gaining popularity in non industrial fieds, such as tungsten jewelry,tungsten men's ring,tungsten women's ring tungsten alloy ring, tungsten wedding ring,gold plated tungsten bands, gold plated tungsten ring, ear rings, necklaces, wrist chains, etc. Because of tungsten alloy special properties of longevity and high durability, it is utilized to make tungsten rings, tungsten rings represent the everlasting love between lovers. Tungsten alloy ring is a great modern choice for anyone who values high quality jewelry that will last a lifetime. This is because tungsten have fantastic physical properties and a great aesthetic all in one nearly indestructible pattern. Tungsten are 7 times harder than stainless steel ring and 4 times harder than titanium rings, tungsten ring's hardness can match the diamond. 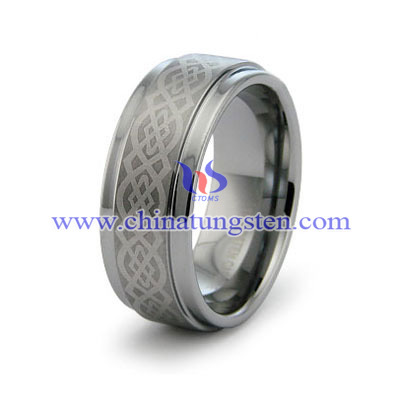 Tungsten alloy rings are hard , stunning , adamantine luster and noble. Tungsten or tungsten alloy have high corrosion resistance. Synthetic perspiration tests showed that tungsten rings are totally non corrosive under normal conditions, will not fade and will not change in colo. Moreover, they are hypoallergenic. 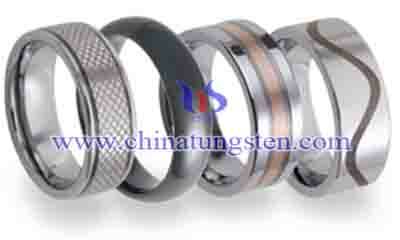 We have many different kinds of tungsten alloy ring. 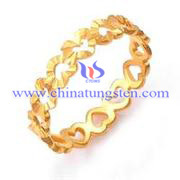 We can also provide tungsten rings with gold coating, such as 18k and 24k. We can include engraving on the rings according to the special requirements of the customers. You can find more details on Tungsten Jewelry. If you have any interest in tungsten ring, please feel free to email us: sales@chinatungsten.com sales@xiamentungsten.com or call us by: 0086 592 512 9696, 0086 592 512 9595. We are at your service.